Powerful corporations are driving the obesity crisis by promoting junk food in the way tobacco firms push cigarettes, experts have warned. 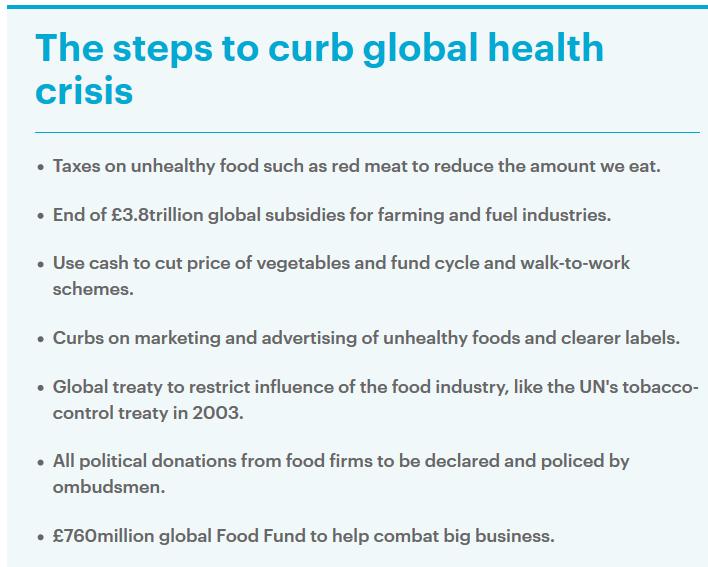 A major report today calls on all governments to unite against ‘Big Food’ in the way they once took on ‘Big Tobacco’. The Lancet Commission on Obesity, compiled by 43 academics from 14 countries, accuses politicians of ‘decades of inertia’. They claim there is a ‘fundamental and irreconcilable conflict’ between much of the food industry and the health of the nation. The experts have now called for a global treaty to limit the political influence of Big Food, modelled on the UN agreement signed on tobacco 15 years ago. And they demanded taxes on red meat and other unhealthy food to subsidise vegetables and schemes that promote walking and cycling. The report was last night condemned by critics as ‘nanny state’ authoritarianism and rejected by the food industry as ‘deeply irresponsible’. But the authors said the health crisis is urgent – with one billion people globally suffering malnutrition and two billion eating too much. In Britain alone, two thirds of adults are now overweight – resulting in soaring rates of heart disease, diabetes and cancer. Professor Boyd Swinburn, of the University of Auckland, added: ‘Until now, undernutrition and obesity have been seen as polar opposites of either too few or too many calories. The academics said food giants are also wrecking the environment by creating a global ‘syndemic’ – three simultaneous pandemics of obesity, malnutrition and climate change. And the scientists accused food manufacturers of trying to ‘obstruct’ obesity prevention with sophisticated lobbying campaigns. The 61-page report says strategies include ‘undermining and contesting scientific evidence’ and ‘framing nutrition as a matter of individual responsibility’. Soft drinks companies spend £38million a year trying to counter efforts to reduce fizzy drinks consumption, they said. The report calls for new taxes on unhealthy foods – particularly red meat – and scrapping subsidies for farming and fuel. Using the cash generated to promote health diets and exercise would be a ‘triple win’ – hitting obesity, improving healthy eating and reducing climate change by cutting car use. They insisted governments need to introduce new laws because voluntary agreements – such as ones that defined David Cameron’s obesity strategy – have failed. Professor Corinna Hawkes of City University in London, another report author, insisted the commission ‘is not trying to put the food industry out of business’. The report calls for a new ‘Framework Convention on Food Systems’ – modelled on the 2003 Framework Convention on Tobacco Control – to help fight junk food firms. But Tim Rycroft, of the Food and Drink Federation, said: ‘Drawing a comparison between tobacco and food is deeply irresponsible. Food and drink are essential to sustain life while even the smallest dose of tobacco is harmful to health. 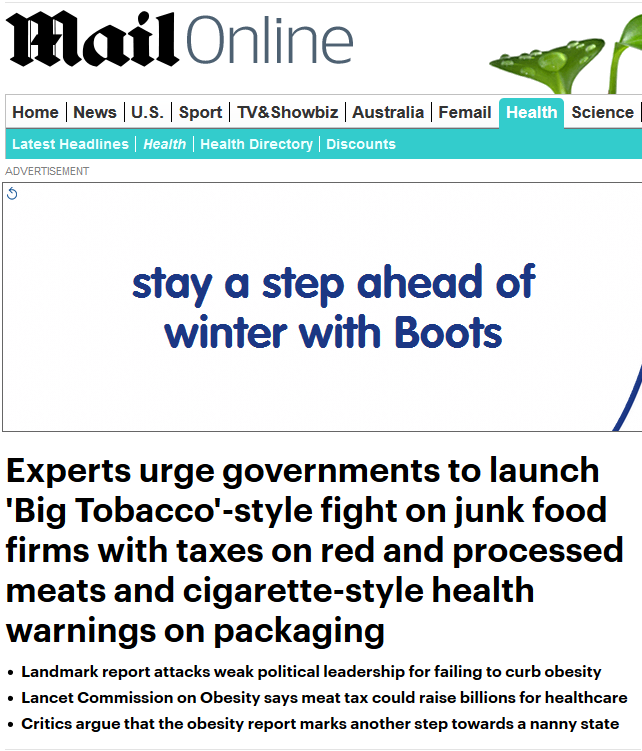 Christopher Snowdon, of the Institute of Economic Affairs think-tank, added: ‘Nanny-state zealots are no longer hiding their intention to use the anti-tobacco blueprint to control other areas of our lives. ‘They are openly contemptuous of freedom of choice and make no secret of their desire to bypass democracy and use unaccountable global institutions to further their agenda. This latest is another in a series of highly politicised reports, following on from others on climate change and air pollution. Indeed this one even dares to drag climate change into its arguments. 1) They are written by fanatics. Indeed, I wonder who appoints them, or do they appoint themselves. 2) They don’t stick to objective analysis, but also enter the field of politics by advocating specific policies. 3) Themes such as social justice, poverty and redistribution are an underlying basis throughout their work. 4) The reports have a strong left wing bias, and tend to be anti-capitalist. 5) Solutions all seem to favour an authoritarian, anti democratic, and global institutionalised approach. ‘Nanny-state zealots are no longer hiding their intention to use the anti-tobacco blueprint to control other areas of our lives. His comments could equally apply to the Lancet’s earlier reports on climate change and air pollution. Let’s be totally clear about this. The Lancet report is not just another of those irritating “Nanny knows best” pamphlets from the likes of Public Health England, with which we are all familiar. As the report itself makes clear, it is aimed at global policy making, and even talks about “national and international governance”, and “a radical rethink of business models”. Am I the only one to find the fact, that the Lancet gives this far left propaganda the semblance of respectability, truly frightening? In answer to your last question – no. 1984 is the blueprint. Sometimes it is good be getting on in years when you see how quickly civilisation is going into terminal decline. I’ve written to the Lancet, a few weeks ago about their biased committees, the so called Climate committee in particular, politely pointing out that the committee only represented one viewpoint and that there were others. No reply received, as expected! The Lancet is becoming the new Big Brother for medical people, who one might hope are well enough educated to appreciate when they are being fed rubbish. However, sadly, medical history has many parallels with climate science: Eugenics, cocaine and heroine all originate as medical science proven sciences, and the infamous case of Dr. Semmelweis takes a bit of beating even by modern climate scientists! He quotes a study in Denmark where volunteers with asthma were exposed to concentrations of wood smoke particles 10 times higher than those generated by a wood burning stove. It was anticipated that acute signs of nasal and pulmonary inflammation would result. Not so. No significant measurable effects were observed. He goes on to say that Gove’s initiative was a pseudo solution to a non existent problem that exiting the EU is intended to avoid. I have always been a person of the centre ground – if pushed I would say centre right. So I am not a fan of the left, especially the far left. Experience has taught me that they always make us worse off. What is truly frightening is the utter disregard for life amongst the modern Marxists that proliferate in the UK and the US now. The number of Democrats in the USA scrambling to make infanticide legal in some states already. They first came for the little ones and it will be the old and infirm next. Just to note that the policy of “legal up to the point of birth” has always been the actual policy of the US, despite attempts to constrain abortion. “the health of the mother” is the “exception” through which a thousands of late term abortions are legally driven every year. The most recent statements about abortion simply reveal what has always been going on. And yes, the Lancet, formerly a responsible publication has joined the American Psychological Association (APA) in promoting political ideas without bothering to support them with evidence. I’m not sure if this is the end of civilization, but it is not pushing things in the direction of maintaining it. Need a warning label on the self appointed ignoramuses who think warnings on real food are a good thing. I have been reading up on Darwin recently. I suggest that pictures of his Grandfather Erasmus (lived 71) and his father Robert (lived to 82) be compared with Charles (lived to 73). Robert was reported as stopping weighing himself when he reached 24 stone (153 kg or 337 pounds on the old scale). Indeed when calling on new patients he used to send his coachman in to check that the floor would take his weight. Their portraits are there in Wikipedia etc. both were doctors unlike Charles who was slim and in perpetual poor health. Probably neither read The Lancet. I believe Charles was in chronic ill health after his voyage, and that is was due to a chronic infection he acquired. Nothing to do with diet IMO. doubt it has its reasons, unconnected with money of course! surgical anaesthesia as ‘Surgical Humbug’. Just to note that the nanny state is nothing new in Uk. Its modern incarnation started in 1947 with the socialist NHS. Under NHS dogma if you get sick i have to pay for your care. Therefore if you eat badly and make yourself sick i have to pay for your care. Therefore I have a right to dictate what you eat, so as to keep you from getting sick, so i dont have to pay for your care. So long as the socialist welfare state exists, in all its communist horrors, I have every right to tell you what you can and cant eat! Its known as moral hazard. Now if i dont have to pay for your healthcare i dont give two —– about what you eat. How can i opt out of the NHS abomination and its welfare state hydra twin? That particular bit sounds more like free market capitalism than left wing authoritarianism. I wonder if that change would be so bad overall. As long as all farming and fuel were included, particularly renewable energy and bio produce then I’d be happy too. A relative of mine use to be a microbiologist and their professional body and journal has become similarly obsessed with articles on climate change and issuing communiques on the dangers. The madness has infected everywhere. And, as I predicted BBC 5live is giving a platform to these environmental lunatics across the spectrum this week. Someone from noplanetB I think and ‘academics’ with suitable climate change/sustainability job titles. All the questions to the ‘experts’ appeared to be by text/email – tame slam-dunkers. Campbell scoffed something along the lines of ‘of course some people believe this is all a conspiracy – but we’re beyond that and won’t be giving air to those ideas’ undoubtedly as he deleted an awkward question. He also announced that he felt comfortable having several children as they are all environmentalists. At that point I turned off. As common people cannot be trusted to eat or drink in a way that the Lancet approves, let’s institute a prohibition, forbid sugary drinks, hamburgers, and pizza. Half a million inspectors will be needed to enforce these new laws, so it will also partly solve a poverty problem. But let’s not stop there – why don’t we simply forbid poverty? Both the USSR and the Third Reich did it with a great success. Obesity is a choice. I’m not obese. Leave me the hell alone. The obese should be easy to spot. Assault them. Leave me the hell alone. The ‘experts’ aren’t fit for purpose. Nanny state needs to cure herself of ‘prevention’ and realize that, we don’t live in a world of control, abstinence by force and human beings being what they are will always do the opposite no matter what they are advised told to do. HMG-NHS needs to get it through their thick skulls – that, wet nursing from ovary/cot to death bed – it ain’t possible. But when has rude reality ever been allowed to trespass into the megalomaniac world of authoritarianism? Obesity is not always the result of over eating. Some people who are ill cannot afford fees for medical insurance. The idea that middle class people are paying their taxes to help the poor is not always the case . In each country where a Goods and Services tax paid by everyone affords revenue and state pensions are paid from contributions from everyone’s pay packet services of health and social security are not unfair . It means that in everyone is paying the same amount for a basic service. Such basic service such as the NHS in Britain Post War meant that the working poor had access to hospital treatment in the best hospitals, as I experienced myself. The best care available was given with no means test. The U S system generally seems to mean ‘devil take the hindmost’ when it comes to health,.judging from comments by your contributors from that country or Federation of States. Not eating always results in skinniness. It never ceases to amaze me how these Left-wingers always default to the evils of big business as the cause of everything. It’s really so pathetic, so unthinking, so juvenile. But the degradation of science is as worrying as the authoritarianism. They use pseudo-science to press their claims and build lie upon our. As humans we have developed a set of genes (about 5% of our total genes) which control our metabolism, growth, homeostasis, and immune system. What the Lancet is proposing is downright dangerous and could lead to real major health problems in the future. Have a look at https://q-genes.com/developing-new-drugs.html where you will see the ” essential missing genes” were found in chicken, BEEF, LAMB, pork etc. If we don’t have these essential genes our immune systems will be compromised, which can only be bad for us. Typical non-scientific thinking, much like their knowledge of climate change. All part of the Global Warming conglomerate. Chairman of the EAT advisory board is Johann Rockstrom, now co-director of the Potsdam Climate Impacts Institute, with Schellnhuber’s retirement. He was a co-author on the the “global diet to save the planet”. Another co-author was Tim Lang, long time “food scares R us” practitioner. Have you ever noticed that these zealots, be they fixated on climate, health, etc. are just plain miserable people? They resort to ever egregious attempts to make others just as miserable as themselves. If they see people enjoying an activity or food, here they come to condemn it. In some perverse way, they seek to self-medicate their own unhappiness by making happy people as miserable and scared as they are. What they need is therapy and not a forum. The other fallout from the tyranny of the miserable is the lack of trust they are fostering. That is very serious. Sunday, a portion of my pastor’s sermon dealt with today’s crumbling society, the lack of trust which it was fostering and the destructive nature of that state of affairs. His list of what you no longer could trust was pretty much in step with mine. Among them: science, news, government, institutions, and medicine. Most of that list has played out on these “pages” over the last several years. That lack of trust is the fruit of the lack of integrity which as been fostered by the very people who seek control. No surprise there. What they have created is a society at each others’ throats and not about to cooperate due to lack of trust. On numerous occasions, my late father observed: “You cannot deal with people who do not tell the truth as there is no basis for dealing.” Daddy was a wise man as was my mother. I am glad I listed to them and observed the life they modeled for their 3 children. Equally frightening is how smart phone technology has allowed the relentless leftist ideology in the media to become both mainstream and plausible. Even as recently as twenty years ago one had to scour newspapers and magazines and have a good memory to join the dots and then compartmentalise both sides of a particular argument and work it out for yourself which one of the arguments was the most feasible at the time. Its now got to the stage of groupthinking herd mentality and worse, no-platforming by the dominant leftist consensus in universities. Another issue is how those outside the consensus, usually found in the private sector are either too busy or too frightened to put ties head over the parapet to disagree with whichever of the leftist scare stories is being promulgated. Cult like – but on a mass scale. The other shoe of Fascism has dropped. Control of all aspects of peoples lives. There is however an obesity problem in western industrialized economies and the cause is poverty and ignorance. Big business and capitalism has done what it does best provide cheap and abundant food for the world to use. However internationally we still have an allocation and distribution problem. Relative poverty (low wages) in the industrialized west means freedom of choice to eat a healthy and varied diet is not open to a growing proportion of the population. Education has failed to deliver on such fundamental issues as how to fuel our bodies to get optimum performance. The leftist education system has lost focus, the chimera of Global Warming among other ideological studies has pushed out the fundamental sciences mathematics, physics, chemistry and biology to the detriment of our health. The solution is not big government, it is, as always appropriate education. The obese do have the choice to eat a decent diet, but it’s easier to order the take-away, go down the chippy, MaccyD’s, send their children there too. Cooking’s too much like hard work. Change channel on the tele, where’s the remote? I really enjoy reading the responses to articles on energy, climate change and so on. The knowledge of the often very expert respondents is uplifting and gives me some hope that true science will overcome the mendacious pseudo-science used by the AGW lobby. Your previous articles on the Lancet’s reports on climate change and air pollution hit the nail on the head. However, the respondents to this article have lacked this rigour, being instead emotional, ad hominem attacks or anecdotal. Maybe the climate enthusiasts who bother to write erudite responses to climate science rubbish don’t read articles on health or obesity. Your own reaction to the Lancet committee’s report shows your distaste for Nanny Statism and calling it far left propaganda suggests a distaste for the subject and its authors. Of course Tim Rycroft of the Food and Drink Federation will condemn this report. He represents Big Food, as large and corrupt a behemoth as Big Oil, Big Pharma and Big Green Energy. But what if the Nanny State is for once correct? What if a far left author is actually telling the truth? Unfortunately for we lovers of all things carnal, the science backs them. Unfortunately casein, the protein found in all meat (including fish, I believe) and dairy products is probably the cause of most western disease. We all know that high levels of cholesterol kill, despite big food’s contrived evidence that eggs might be good for you. I now treat any scientific report on food published by anyone associated with big Food the same way you would treat the Met Office’s long-term weather forecast or UEA prognosis for anything. The evidence has been there for decades. Big food, in cahoots with every government since the second world war has been suppressing it. I really respect what you are doing with this website in furthering science. I can’t expect you to apply the same dedication to a new field – even though big food is probably the major risk to the environment today but I would ask that before you support the vested interests of the food industry that you gather some independent information. As a gentle beginning may I recommend “How Not To Die” by Dr Michael Gregor. Every statement he makes is backed by real science – almost half the book consists of references. The famous “Vegan Propagana” of “What the Health” is also worth wasting some time on. The right doesn’t have a monopoly on truth.